Fantastic Beach & Tropical Gardens;! Wifi, free Canada calls. Our comfortably furnished Kihei Kai Nani vacation condo will be your home away from home. Located in a lush tropical setting; palms, vibrant flowering trees, and the sweet perfume of plumeria and hibiscus will surround you. Afternoon tradewinds and interior fans keep our condo comfortable year round. Our furnishings are tropical as is the wall art, and we offer all the amenities of home including a kingsize bed and full size Bosch washer and dryer. The kitchen is complete with all large and small appliances and plenty of table ware. You will enjoy watching the 42' Samsung Smart TV & DVD player, complete with film library, and we provide free cable, WiFi, and Canada calls. Dine indoors or out on the lanai and enjoy the antics of the many varieties of birds in the nearby trees, or lounge with a good book at Kihei Kai Nani's large beautifully renovated swimming pool. Of course we provide beach chairs, umbrella, towels, cooler and mats for your beach use. Don't forget we are a NON-SMOKING RESORT. Beautiful Kamaole Beach II, only a five minute stroll from our front door, awaits you for a morning swim or snorkel in its warm, blue waters with sea turtles and tropical fish; and at sunset to bask in the glow of a radiant sky while the gentle surf teases you to return for an evening dip, or to take a barefoot walk along the surf-line. In the winter months, humpback whales will entertain you as they frolic in the nearby sea. 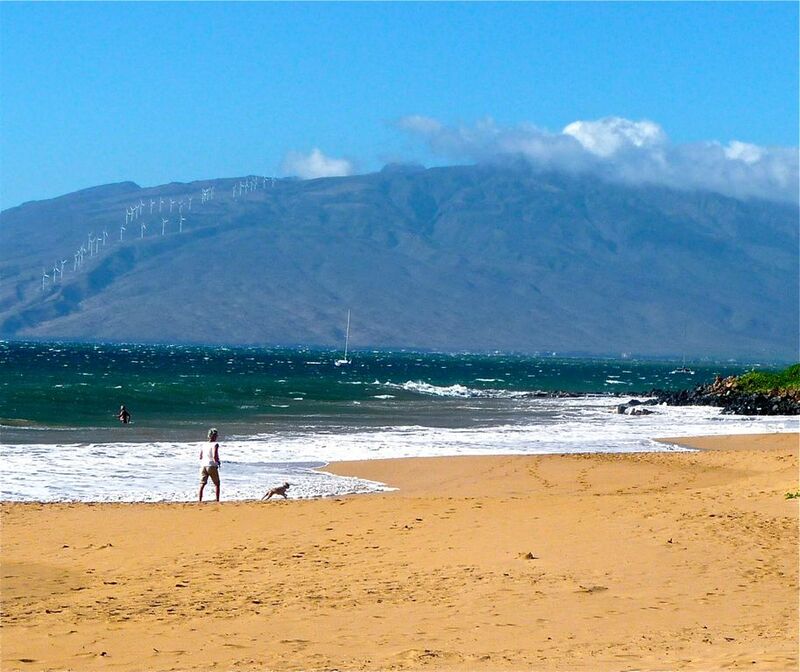 Kihei is centrally located for all of Maui's activities. Shopping and restaurants are an easy walk away, and Wailea, the home of elegant resorts and world-class golf courses, is just minutes away by car. The famed Maui ocean center with our acquarium is located in nearby Ma'alaea, where you can also book your whale watching and boat adventures. We are both retired; Lothar as a San Francisco, CA juvenile probation officer, and Carole as a high school English/history teacher/librarian. We have 2 wonderful sons and 4 fantastic grandchildren living in Hawaii. We split our year between CA and HI, enjoying spending time with family and friends in both places. We also enjoy traveling to far-away places. In Maui, we ocean swim and snorkel every morning at our lovely Kamaole Beach, just across the road. We also enjoy water aerobics and long beach walks, especially at sunset. Carole loves to cook and entertain family and friends in Maui and San Francisco. We both love to read and watch good films, and enjoy listening to both classical and folk music- especially if we can sing along! We bought our KaiNani condo in 1984 on our first visit to Maui. We fell in love with the beautiful gardens, fabulous Kamaole beaches and the warm aloha feeling on the property. KaiNani really is like a small village. People here really care about their environment and neighbors. We use this unit as our rental unit and for family and friends visits. Our grandchildren have grown up visiting us here and love 'our' beach and pool. We can't imagine a better vacation for them (or us). We hope you'll enjoy dining on our lanai, watching our visiting birds and enjoying the beautiful blossoms of every hue, as well as the tropical scents they send to remind you that Maui no ka oi! (Maui is the best!). Our winter guests have the added benefit of watching hump back whales blowing and leaping right from our Kamaole beaches. We are across the road from Kamaole 2 Beach. Haleakala volcano mountain may be seen all the way to the top from lanai. We have a slice of ocean from the lanai, which is a short 5 minute walk from our condo. Answering machine provided for your messages. We provide all linens including beach towels and beach mats. Comfortable furniture to relax in. Leather couch and rotating rocking chairs. Our dishware and silverware service is for 8. Our appliances include a ceramic top stove with self-cleaning oven, full size dishwasher, full size microwave oven and refrigerator. We also have a coffee maker, blender, toaster oven &hand mixer. 42' Samsung Smart TV. Full Internet and Netflix availability. Playing cards and board games including Scrabble, Chess, RummyO and Chinese checkers. Jigsaw puzzles too. We have a DVD library of popular films for your enjoyment. We are surrounded by tropical gardens and different birds. Bike rack available for your use. Our 30' X 60' pool is one of the largest on Maui-great for lap swimming or quick dips. We have wonderful garden views and complete privacy in our condo, which is located in the rear of the resort. The property is a 7-acre lowrise 2-3 story development, lots of open space, large pool and lounge area, easy access to Kamaole 2 Beach, a beautiful white sand beach directly across from the resort. Golf at nearby world-class courses - Wailea, Makena, Silversword, *Snorkel at our Kamaole beaches and many others, Humpback Whale watching from December till May, *Visit the Maui Ocean Center Aquarium at Maalea Harbor,take the Sugar Cane Train,shop the galleries in Lahaina and Wailea, *Winetaste at Tedeschi Vineyards and explore Upcountry, *Go to a fitness center or spa for a massage, *Play tennis, softball, soccer,go inline skating, skateboard at Kalama Park, Paddle board, right off Kamaole Beach, *Dance at Grand Wailea hotel laser disco or the many small clubs, *Hike, horseback ride or bicycle down the Haleakala volcano, or take an ATV and zipline tour, *Hike the Iao Valley, visit the Botanical Gardens and the Maui Tropical Plantation, *Enjoy Maui Community Center theater, Myth & Magic theater, and resort Luaus, *Go Fishing, and Jet Skiing, *Finally, visit lush Hana, explore lava caves and the multitude of waterfalls along the way!